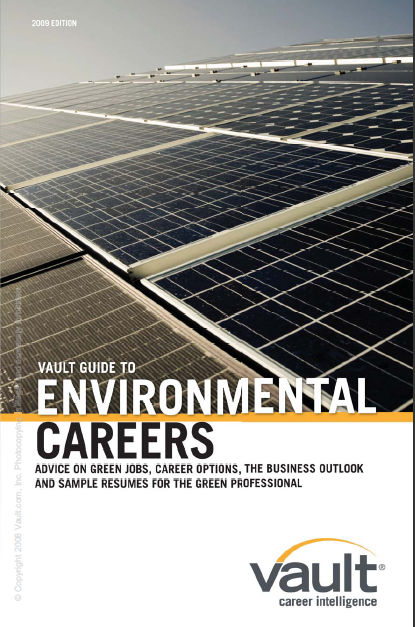 In conjunction with our Green Initiatives in the Workplace Survey Results, Vault also released the Vault Guide to Environmental Careers today. Why? Because if you are constantly surrounded by news about green jobs, their increasing potential and the promise of a stable career for a long time to come, you might want to know what these jobs exactly involve. We figured, if its all in place, it makes a better reading, a quicker grasp and a comprehensive understanding of whether it is right for you and what aspect of environmental and green initiatives you might want to pursue. Information on the $4.3 billion set aside for smart grid technology, as part of the Economic Stimulus Package and the $7.22 billion in projects and programs managed by the Environmental Protection Agency that makes up a fraction of the American Recovery and Reinvestment Act. An in-depth examination of the different environmental organizations, from government to the non-profit and private sectors, and the roles they play in the environment. The section includes information on what companies do within each industry, websites that might be helpful in a job search and the types of jobs that have been available. A breakdown of what environmentalists do on a daily basis, offering a brief glimpse of the varying fields job seekers have to choose from. An extensive list of environmental jobs to choose from, including information on each position, websites that offer these environmental jobs and in some cases an informative look into what the future might hold for a particular environmental jobs (i.e., the need for hydrologists is that is expected to grow in the next decade, in response to the environmental goals of the Recovery Act of 2009). A rare glimpse into the day in the life of various environmental workers including the schedules of a policy analyst at the EPA, an ecology professor, a national park ranger and a regional planner at a nonprofit. The guide also offers tips on laying the groundwork for a future job in the environment and succeeding in the hiring process, complete with examples of resumes and cover letters. Click here to download it in PDF. Do We Really Need Another Study? Ceres Certainly Thinks So!